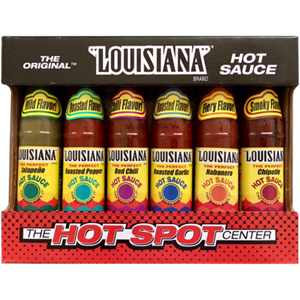 The Hot Spot Center-The Original Louisiana Hot Sauce - 6 Pack of 3 oz. bottles includes: Louisiana Roasted Pepper Flavor Hot Sauce, Louisiana Chipotle Smoky Flavor Hot Sauce, Louisiana Red Chili Hot Sauce, Louisiana Jalapeo Flavor Mild Hot Sauce, Louisiana Habaero Fiery Flavor Hot Sauce & Louisiana Roasted Garlic Hot Sauce. Louisiana Roasted Pepper Flavor Hot Sauce - Has a great roasted flavor! Great on fish, chicken and eggs!!! Ingredients: Fully Aged peppers, vinegar, salt, Red Bell Pepper powder & natural flavor. Louisiana Chipotle Smoky Flavor Hot Sauce - Has a delightful smoky flavor! Great on burgers, steaks and mixed with BBQ Sauce!!! Ingredients: Fully Aged peppers, vinegar, salt & Chipotle peppers. Louisiana Red Chili Hot Sauce - Has a delicious Chili flavor! Great on rice, beans and wings!!! Ingredients: Fully Aged peppers, vinegar, salt, Chili pepper & spices. Louisiana Jalapeo Flavor Mild Hot Sauce - Has a great mild flavor! Great on tacos, eggs and in gumbo!!! Ingredients: Jalapeo peppers, vinegar & salt. Louisiana Habaero Fiery Flavor Hot Sauce - Has a fiery flavor! Great in chili, on wings and in soups!!! Ingredients: Habaero peppers, vinegar & salt. Louisiana Roasted Garlic Hot Sauce - Has a delicious roasted flavor! Great on wings, pizza and pasta dishes!!! Ingredients: Fully Aged peppers, vinegar, salt, roasted garlic & natural flavor.